The Androids of Tara originally aired in 1978. It was the fourth part of The Key to Time saga. There are some things that I know I should probably feel guilty about – cases where my opinion is so clearly distinct from the general consensus that I feels some sense of obligation to apologise for my radical and far-out ideas. While it falls just short of that mark, I honestly enjoy The Androids of Tara as the best story of The Key to Time. I’ll concede it isn’t as masterfully written as The Ribos Operation, nor as full of wonderfully clever constructs as The Pirate Planet, but The Androids of Tarais a refreshingly small-scale adventure that manages to accommodate the awkward humour that this era of the show is accustomed to, while remaining an excellent adventure in its own right. There’s no threat to the entire universe at play here. The planet under threat isn’t Earth, and the threat isn’t one that carries the weight of a threatened genocide or ethnic cleansing. In essence, The Androids of Tara is an adventure set within the royal court of an alien planet. While there are lives undoubtedly at stake, one wonders whether how the story plays out will have any true impact on the citizenry of the planet, beyond slightly harsher taxation, or a new face on the unit of currency. Count Grendel, the villain, is an evil man – but he’s not insane. Were he to ascend to the throne, he probably wouldn’t be the most dynamic or effective ruler, but he’d hardly introduce pogroms or wide-scale public executions. So while the lives of the immediate players – the Doctor, Romana, the Prince, the Princess – are all at stake, it never feels like the weight of the universe is on the shoulders of any of the characters. Even the story’s segment to the Key of Time is found relatively quick. I noted in my review of Stones of Blood that it’s hard to take a horrific threat especially seriously when it’s counteracted by the awkward comedy. As a general rule, the larger the threat, the more awkward the humour feels (with the occasional exception, like the superb City of Death). Here, instead, we get a rather more intimate little story. Drawing from the classic The Prisoner of Zenda, the story feels like relatively light fantasy, updated for the show with a charming sense of whimsy and fun. 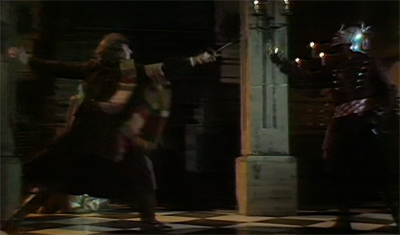 In fact, the show is remarkably honest about it, with the Doctor remarking of the plan, “Well… it has been done before.” So knights battle with “electrically charged” swords, and the Doctor picks up a crossbow to remark, “It fires electronic bolts. How very quaint.” I’ve remarked before that the show has always seemed a bit more comfortable offering historical stories rather than science-fiction on the admittedly modest budget, and The Androids of Tara looks like it could be a medieval adventure with just a few sci-fi touches. The plot’s remarkably straight-forward and populated with relatively simple archetypes. There’s a foul villain with a castle (complete with mandatory dungeon) and a plot to take the throne from the beloved prince. There’s a society built on ceremony and occupying a world full of horses and castles and swordsmen. Nobody could possibly get lost in the story, and it doesn’t feture any particularly radical or ingenious ideas. Instead, it simply delivers the opportunity for some wonderful performances and some great lines. Hell, there’s a wonderful relish that Jeffrey brings to the role, seeming to love ever moment of it, devouring his lines with great pleasure. Introducing Romana to the princess, he explains, “In fact, Tara’s most eligible spinster, shortly to become, in rapid succession, my fiancée, my bride, and then deceased.” The fact that Jeffrey plays him so well (and the relatively small-scale of his villainy) mean that his embarrassed retreat at the episode’s climax is a satisfying conclusion, swearing at the Doctor and vowing vengeance as he swims across his own moat. Despite seemingly operating on a much smaller scale than most baddies, there’s something undeniably unpleasant about him. There’s the fact that he seems to abuse his relationship of authority with his house staff, remarking of Lamia, “She’s prejudiced, my dear, just because I once showed her a certain courtesy.” It’s one of the nastiest pieces of subtext I can remember in an episode, and it just sneaks in, right under the radar. What makes it even more disturbing is the fact that this has created a very warped and distorted and uncomfortable relationship between the pair, with Lamia clearly attracted to Grendel, who views her as little more than a sexual object and provider of high-quality androids. “I don’t want him,” Romana suggests to Lamia, “but you do.” At one point Grendel wonders what he’d do without Lamia, prompting the woman to reply he’d simply hire a replacement, leading Grendel to assert, “True, but I would not find one who pleases me so much.” It’s all remarkably uncomfortable, and all the more effective for it. Till death do them part? Though the setting allows the show to look relatively impressive while staying within its relatively tiny budget, I’d be remiss if I didn’t point out some of the cheesier moments. None of them ruin the serial, which is all in good fun, but I found something hilarious about android!Romana shooting killer lasers from her tummy! “Rather ingenious, don’t you think?” Count Grendel asks, and I’ll concede it’s certainly unconventional. Then there’s the rather obvious android!king who gets impaled with a spear, when there must have been more convincing ways to do that shot rather than swapping the actor out with a dummy. Outside of that, though, the serial works relatively well as an illustration of how the relationship between the Doctor and Romana is developing. He entrusts Romana to find the piece alone, which – while a handy way to get her involved in the plot quickly – is also a sign he’s coming to trust her more. “You find it,” he insists, “I’m taking the day off.” While he might patronise her a bit (“that shouldn’t give you too much trouble,”he suggests), it’s hard to imagine the Doctor showing such complete faith in a human companion, trusting them to handle the adventure pretty much by themselves. Mary Tamm continues to be incredibly wooden here, despite some nice scenes (her attempts to ride a horse, for example). Any suggestion that Tamm is simply bad as Romana are dispelled when she’s asked to step into the dual role of Princess Strella. 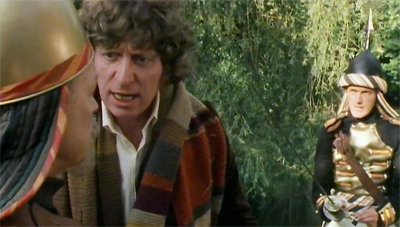 They only share one scene, but it’s almost painful until Tom Baker arrives to liven things up. Again, I love the idea of Romana as a companion, but Mary Tamm is perhaps the weakest actress to share the screen with the Doctor on a regular basis. Still, the story does well to give Romana quite a bit to do. The other companion who does quite well here is K-9, the robot dog. I don’t like K-9, but I don’t hate him. He’s more a representation of the show’s slide into camp and light-hearted far after the Hinchcliffe seasons (introduced in Hinchcliffe’s final story, The Invisible Enemy, for extra symbolic value). There are certain stories where K-9 works, and certain stories where he sticks out like a sore thumb. 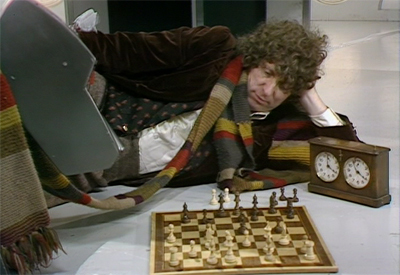 Though I’d argue that there were more of the former than the latter, I’d also suggest we works really well here, from his introduction beating the Doctor at chess (and calling the Doctor out on underhanded tactics like stalling, reminding him, “Clock, Master”) and the general presentation of the character as perhaps more efficient and effective than the Doctor. The Key to Time season is interesting, because it really presented the first TARDIS crew where the Doctor was arguably the least competent member. There are a whole host of small elements that add up to make The Androids of Tara the most enjoyable adventure of the year, with its fun dialogue, relatively light plot and quirky sense of humour. I’ve always argued that it was possible to do the show with a lighter touch, and that lighter was not necessarily a bad direction, and I think The Androids of Tara exemplifies it.